5.Giving your family a premium and health water as well as clearer, healthy ice. Superior Water Filtration to Efficient contaminants reduction- Use the Advanced Technology to remove Odor, Sediment, Dirt, Rust,Turbidity,Chlorine, Lead, Mercury, Cadmium, Thallium, Heavy Metals and Harmful Sediments. Saving Money - Pay 1/2 Price of Other Brands without Compromising Taste or Purity. Experience the same quality of filtration without any sacrifice to the water flow rate. Easy and Quick to Install. Change the Filter Every 6 Months or 300 Gallons- For optimum performance that recommended you change your filter every 6 months or 300 Gallons. Giving your family a premium and health water. This high flow rate filter create better tasting water for drinking and create the beverages as well as clean, clearer, healthy ice. 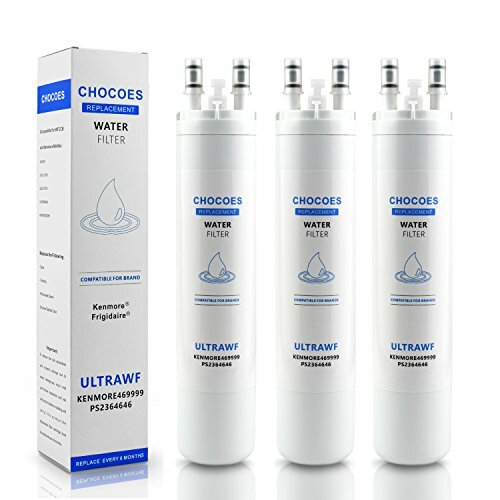 100% Quality and Satisfaction Guarantee - If you're ever unsatisfied with Our ULTRAWF replacement water filter, Contacting us for a Full Refund to you! If you have any questions about this product by CHOCOES, contact us by completing and submitting the form below. If you are looking for a specif part number, please include it with your message.